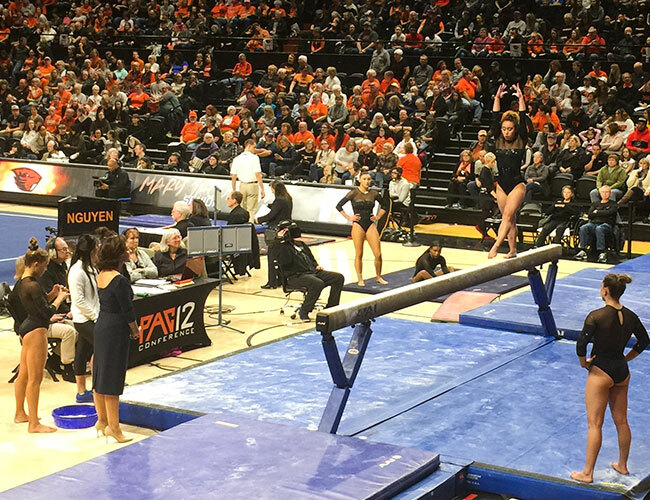 Yesterday I went to my second ever NCAA gymnastics meet at Oregon State. My husband is a prince about going down to Corvallis with me. He’s watched enough that he gets the basics. My favorite teams are generally the ones I can see with my cable package. It used to be limited. In the past couple of years I went from being able to get 1 or maybe 2 meets a weekend to more like 4-5 meets a weekend which is more gymnastics than I can handle. I love all the Pac-12 and SEC teams since I see them the most. But UCLA is among my very favorite teams so I was just like all the other kids at the meet, completely enraptured with every moment. There is so much fun stuff in person that you don’t get to see on TV. Both teams were amazing. It was a super fun day. Back to work on Book 4. I think I’m still on track for my Spring 2019 release. This entry was posted in Epic by Pamela. Bookmark the permalink.